Lippmann, Friedrich. 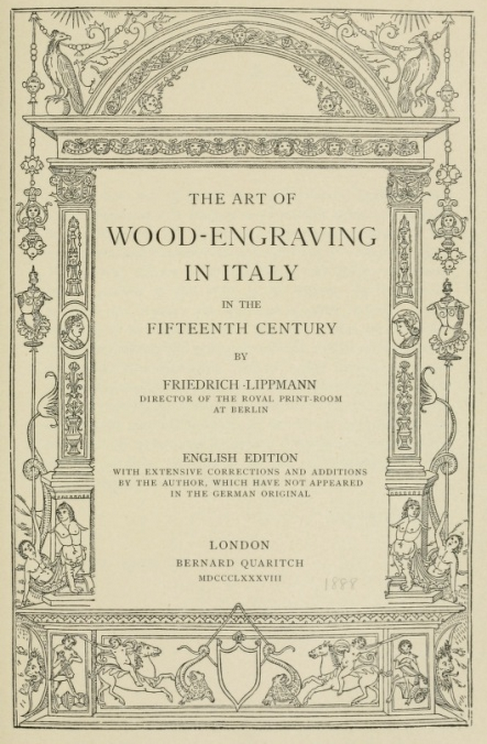 The art of wood-engraving in Italy in the fifteenth century. London: Bernard Quaritch, 1888. Provenance: Morris. — Richard Bennett. — Sotheby 1898, lot 664 (sold to Henry Wellcome for 18s.). — Henry Wellcome. — Wellcome Library (Closed stores Hist. 2 ZHB.34 (Oversize )). Reference: MS catalogue (2), no. 523.